Are you competative? Do you like to do fun things for great causes? 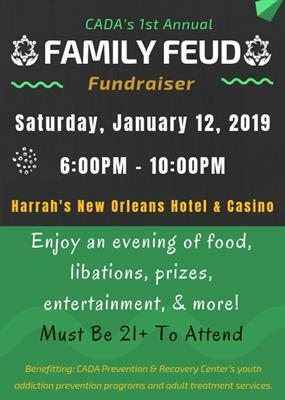 Do you like food, open bar, and some live entertainment? If you answered 'yes' to one or more of those questions, then THIS EVENT AT HARRAH'S is the one for you to be at! 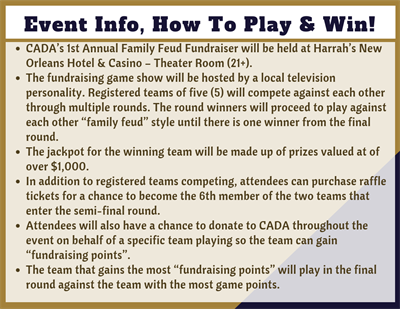 CADA’s 1st Annual Family Feud Fundraiser will be held at Harrah’s New Orleans Hotel & Casino – Theater Room (21+). The fundraising game show will be hosted by a local television personality. Registered teams of five (5) will compete against each other through multiple rounds. The round winners will proceed to play against each other “family feud” style until there is one winner from the final round. The jackpot for the winning team will be made up of prizes valued at over $1,000. In addition to registered teams competing, attendees can purchase raffle tickets for a chance to become the 6th member of the two teams that enter the semi-final round. 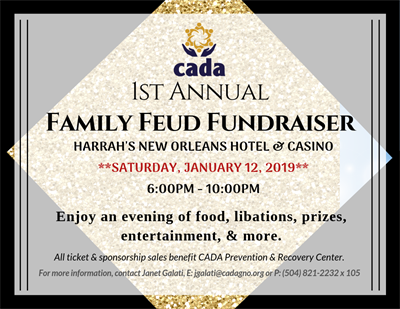 Attendees will also have a chance to donate to CADA throughout the event on behalf of a specific team playing so the team can gain “fundraising points”. The team that gains the most “fundraising points” will play in the final round against the team with the most game points. Sponsorship Levels That Include Creating A Team To Compete Available But Limited! Additional sponsorship opportunities & event exhibitors that include attendee tickets available!